Scroll down to bottom of page for giveaway info! Question: How does one avoid awful neck pain resulting from intense head banging during awesome 80s air guitar solos at wedding receptions? Unacceptable answers include "don't intensely head bang during awesome 80s air guitar solos at wedding receptions" and "don't be 30 years old". Can I tell you about the terrible horrible no-good very bad day I had last week? I'm over the trauma of it, and it's funny now, I swear (I think). 8:20 am - Go to take laundry out of dryer. When lifting head up from dryer, nail the top of my head so hard on the corner of the suspended platform holding up the water heater, that I sort of fall to the floor and tears instantly start exploding from my eyes. 8:40 am - Leave house to take adorable pup and BFF Newton to vet for boarding. Vet is 10 minutes from my apartment, so I'm giving myself plenty of time to be on the road by 9:00. Apocalyptic monsoons erupt everywhere around me. Flooding! Traffic! Cursing that would make my mother blush! Absolute Madness. 9:15 am - Still driving, but finally on straight path to vet. 9:20 am - NEWTON PEES IN MY CAR. 9:30 am - Drop arch nemesis off at vet. Attempt to clean car with the best CVS has to offer, while getting drenched outside. 10:00 am - Finally get on the road. 1:30 pm - Arrive in Austin 1 1/2 hours late, after having sat in pee-smelling car for 3 1/2 hours, where I cannot open windows because of aforementioned monsoon, only to discover I have been dragging a GIANT tree branch under my car for God knows how long. The car was fine. I'm fine. Still not speaking to Satan's right hand canine, but we'll get through this. So thank you for the therapy session. While at times it may seem that food bloggers live lives of rainbows and sprinkles and chocolate chip cookies, I am here to report that we still have dog-peeing-in-our-cars kind of days. Jon and I went to dinner recently with our friends Lindsey and Caleb to Kiran's, where we all ordered from the Houston Restaurant Weeks menu. 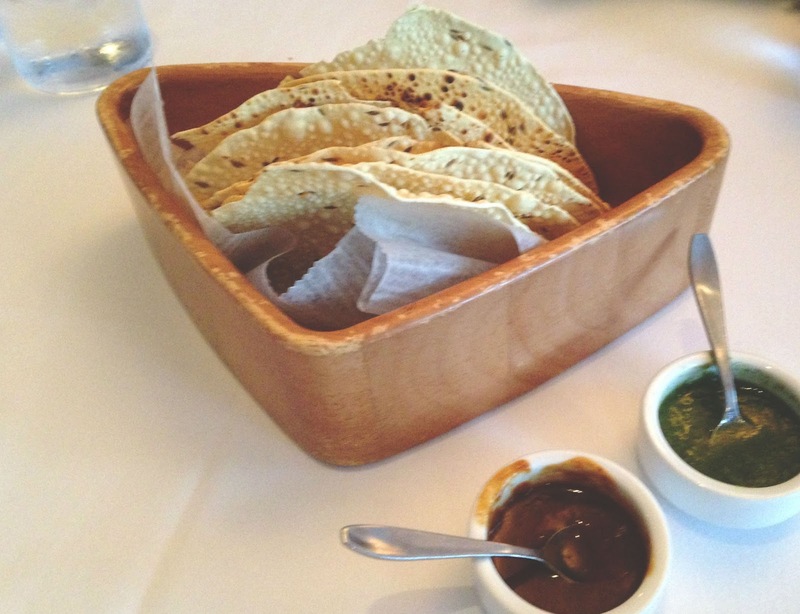 Since Kiran's serves Indian food, vegetarian options abounded! We sat down and were greeted with a lovely little starter of crispy flatbread (if anyone knows the name for this, I give you full permission to start writing all future blog posts) and sauces. The red sauce tasted like a barbecue sauce, while the green sauce seemed like some sort of spicy pesto. Both were great! For my first course, I ordered the soup flight with onion bhaji, and holy smokes, y'all. The three soups, served in little drinkable espresso-type cups, were tomato saffron, mulligatawny, and corn chowder. Each soup was completely different from the next one, unique in its own way, and downright delicious. 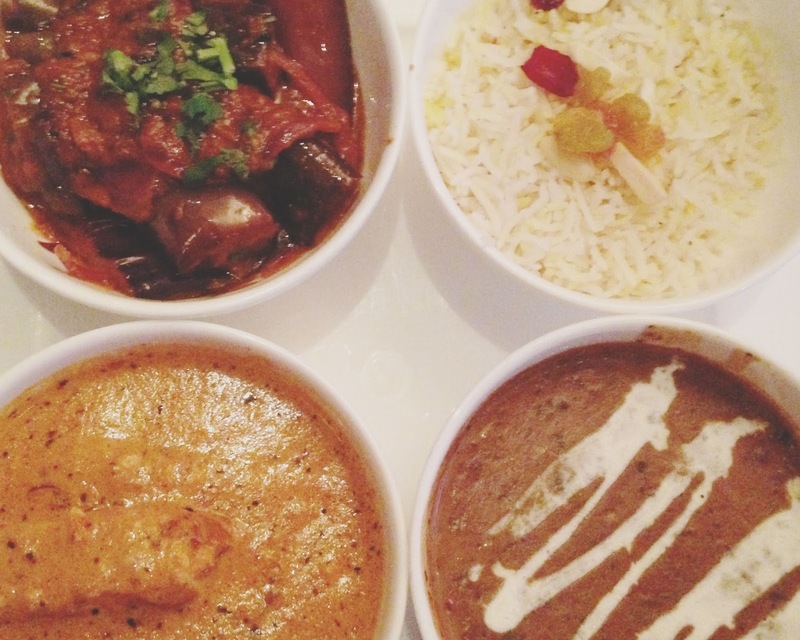 The tomato saffron was crisp, light, and acidic, and the mulligatawny was briney and earthy. My favorite (and the crowd favorite) of the three was the creamy, hearty, sweet corn chowder. 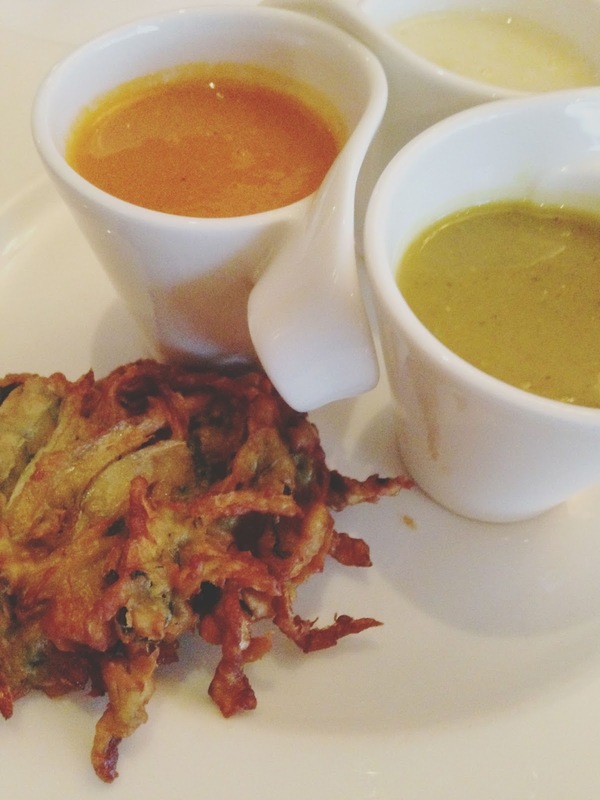 The onion bhaji served with the soups seemed to include zucchini, and the result was a beautifully battered fritter. Outstanding! For my second course, I ordered the chef's vegetarian tasting, which included (pictured below, clockwise, from top left) bagare bengan, saffron rice pulao, daal makhni, and paneer makhni. 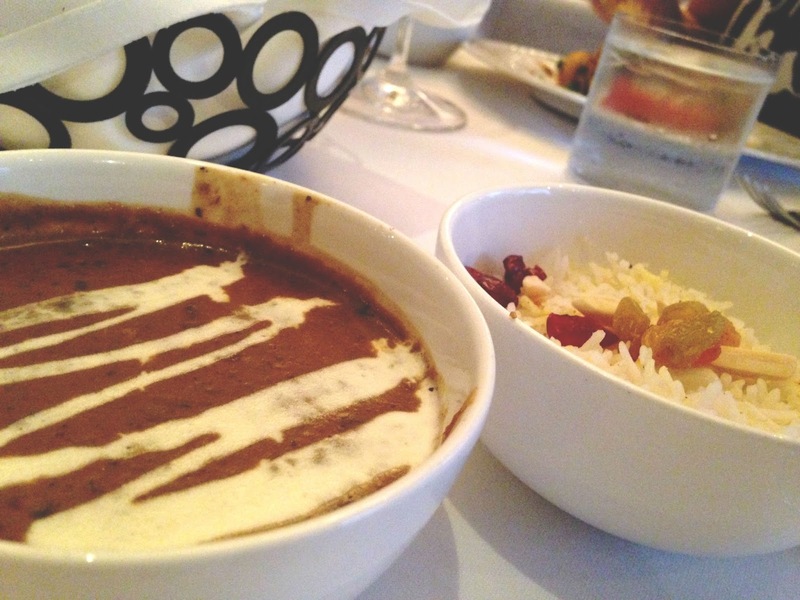 Made up of lentils and kidney beans, the smooth, filling, pureed, daal makhani reminded me of refried beans - but a more carefully concocted, silky, refined version of refried beans. I was a fan for sure. The saffron rice pulao was pretty flavorless and wasn't anything thrilling, but it did serve as an excellent neutral base to the paneer makhni. 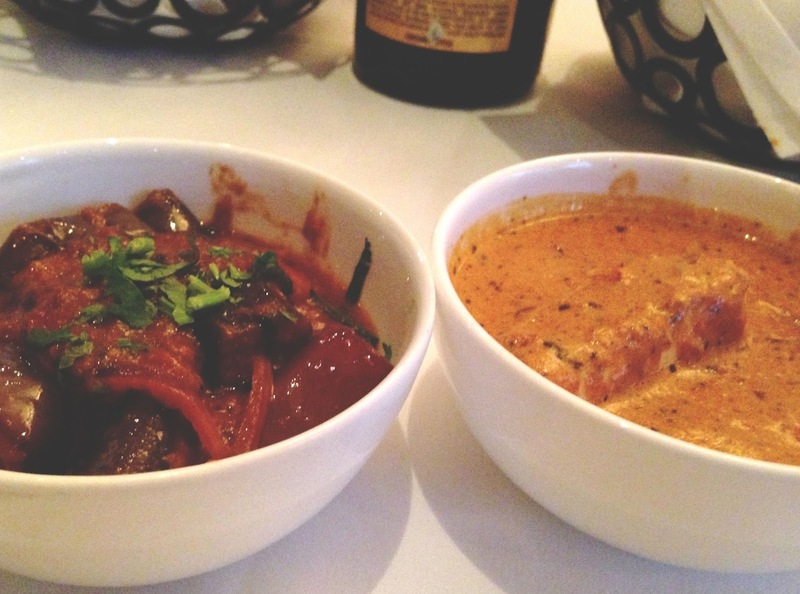 The bagare bengan, a stew-like eggplant curry, was earthy, and nuanced with many different exciting spices. This was my second favorite of the four entree bowls. My FAVORITE of the four though? 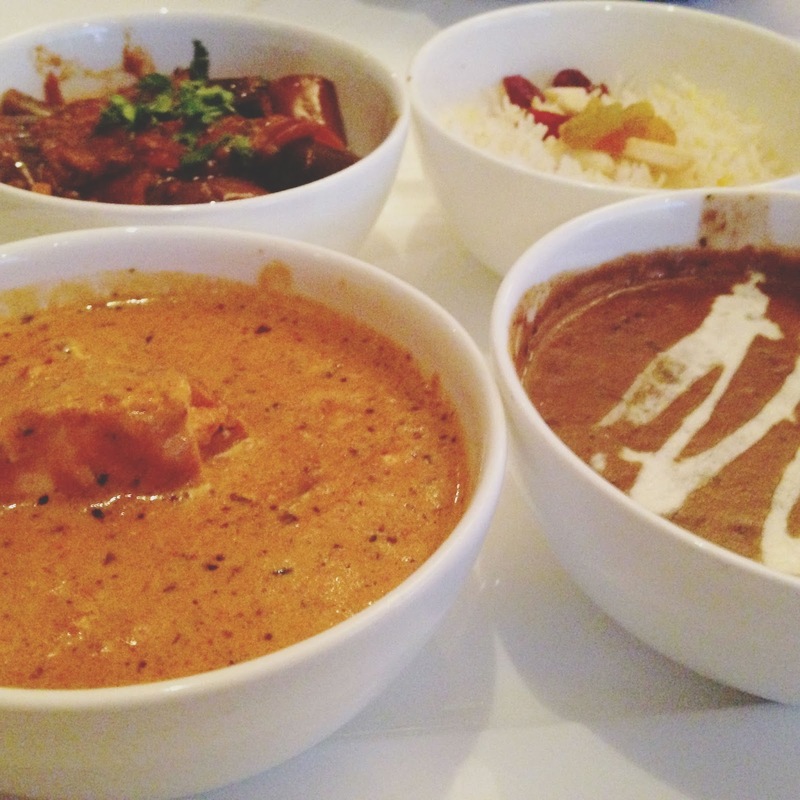 The paneer makhni was absolutely incredible. Tofu swimming in an intoxicating, sweet, spicy, thick, cheesy masala-like sauce made this a remarkable, unforgettable dish. Spooned over the saffron rice pulao? Heaven! According to the HRW menu, there was also supposed to be English cucumber raita and some lachedar paratha or chickpea pancake, which were not included in my meal. However, there was so much food put in front of me that I totally forgot about those items and did not miss them at all! (and let's be honest, I hardly had a clue what I ordered in the first place anyway). For dessert, all four of us ended up ordering the bread pudding, and all four of us thoroughly enjoyed it. The pudding is a swirl of apricots, cranberries, and white chocolate crème anglaise. Not too sweet, this dessert was right up my alley! 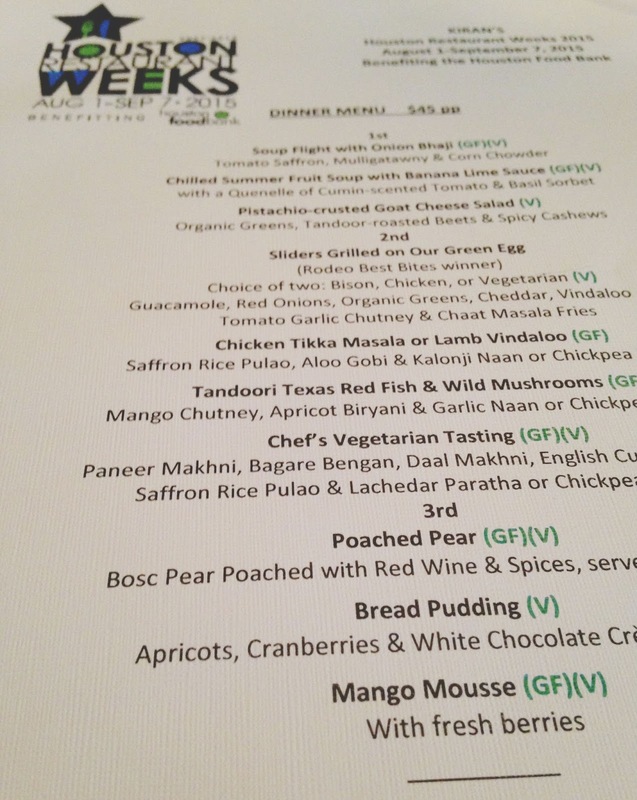 Kiran's hits it totally out of the park with their food, specifically with regards to their Houston Restaurant Weeks menu. Each dish was sprinkled with variety, care, and an orchestra of palate-pleasing flavorful surprises. 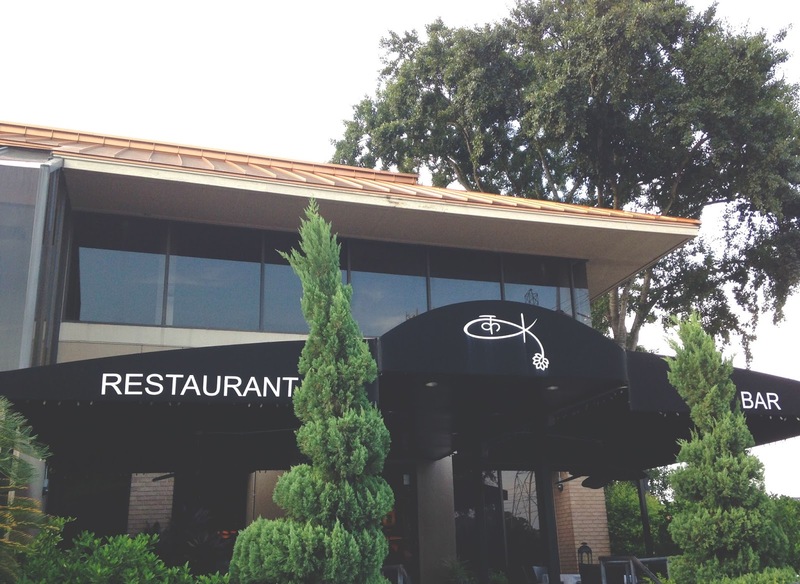 Restaurant Weeks is the perfect way to experience the many outstanding offerings there! 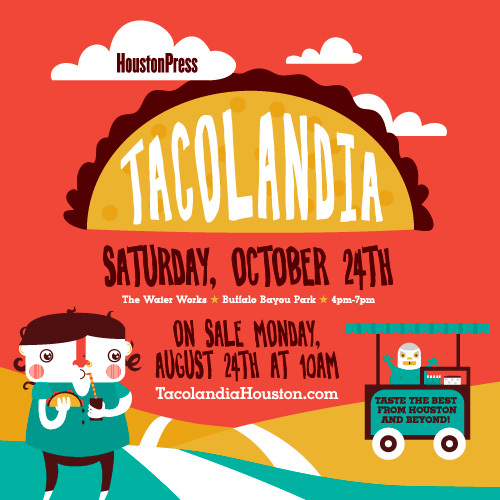 On Saturday, October 24, The Houston Press is hosting their Inaugural Houston Press Tacolandia. Tacolandia is an outdoor taco-sampling event and festival that will feature Houston’s best tacos, ranging from urban contemporary to authentic street style. The event is complete with live music and a cash bar with beer and cocktails, as well as awards for best tacos in various categories! One lucky Adventures in a New(ish) City reader will receive two (2) general admission tickets to this year's Tacolandia, held at Buffalo Bayou Park in Houston on October 24 from 4:00 pm - 7:00 pm. To enter, all you have to do is follow me on Instagram (if you don't already), post a picture of your favorite taco, and use the hashtags #TacolandiaHOU and #newishcityHOU in the description. The contest will run from now until Friday, August 28, 2015 at 5:00 pm CST. The more creative, funny, and insightful your entry, the better! 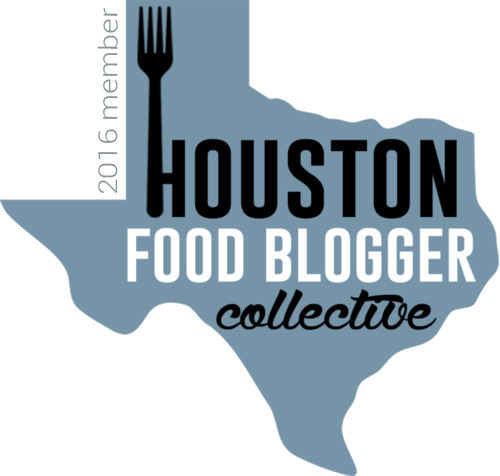 You must be a Houston resident to enter, and only one entry per person, please. One lucky winner will be picked and announced by Saturday, August 29, 2015. Monsoon Day was the worst. You poor thing! I refer to those crispy bread things as Indian chips and salsa which is definitely not the right term but it makes sense, I think? Also, love raita so so much - why can't we all just keep it in our refrigerators as a mayo substitute? This sounds like a great meal! You totally need to patent the term "Indian chips and salsa" before someone (*cough* ME *cough*) steals it. That's incredible. Honestly, I didn't know half the things I was eating, but I really loved it all! So yes to raita!